I don’t think I’ve gotten this much use out of a Christmas present since the one time my brother and I got a Nintendo for Christmas in 1985. I’ve been trying to take the new camera out every chance I get to get a few pictures, or as much as I can while having to go to work and do stuff like that. There was one night last week that looked like it might have a great sunset, but the best light had faded by the time we got to the park. But the clouds did look pretty cool as they slid past the downtown skyline. Last weekend, Caroline and I decided to take a little trip to the lodge at Mount Magazine State Park. Which if you've never been there, is surprisingly very nice. It was actually nicer than the lodge we stayed at when we went to Yosemite (although the one at Magazine is only a few years old). The rooms were fairly inexpensive and spacious, and we had access to an indoor pool and hot tub. Our room at the lodge also had a nice view from the balcony of the Arkansas River Valley, and the Ouachita Mountains off in the distance. I brought the new camera, and was eager to take some more pictures at night. Luckily there was no moon, so the sky was filled with stars. It was nice enough at the lodge that I just stuck the camera on the balcony, and tried to take some pictures of star trails. I wasn't the only one, in fact there was a photographer staying in the room next to us that was out on the balcony taking star pictures as well. 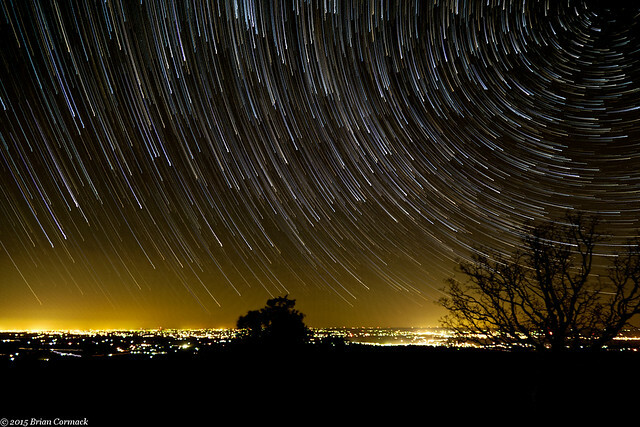 It was a really nice place to take star trail pictures. After a few minutes spent getting everything set up, I just simply went back inside and relaxed in the comforts of the room while the camera went to work. 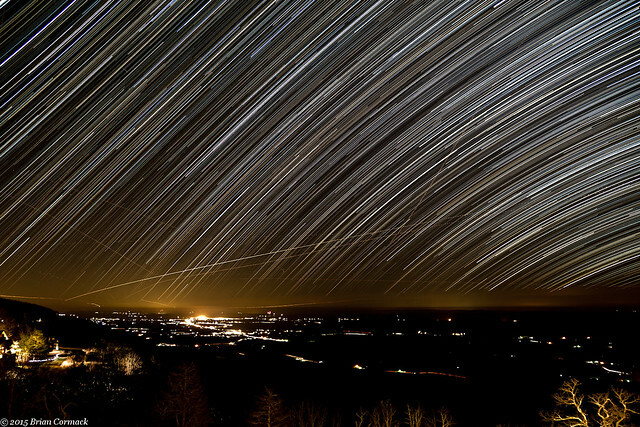 Over the course of two hours, the camera took about 240 thirty second exposures. They were all stacked together when I got home to create this view. This is looking towards Blue Mountain Lake. I believe the city lights in the distance are from the small town of Havana, Arkansas (population 392). I tried again the next night for another shot. I gave up the comforts of the lodge and drove over to one of the overlooks on Cameron Bluff. The conditions weren't ideal, strong gusts of wind would blast across the valley and hit the mountain. I tried to take enough pictures for another long set of star trails, but several had to be discarded due to camera shake. This is about a hundred shots, all stacked together. The view is looking off to the northwest, with the city of Paris, Arkansas, in the distance. We headed home the next day, but I made one stop along the way. 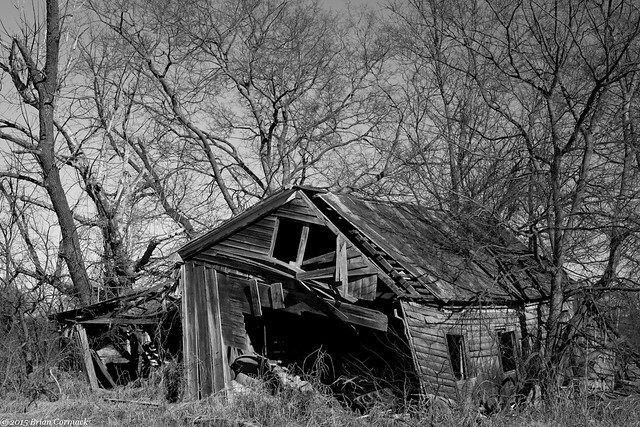 There is an old barn near Subiaco that I wanted to see, since it's leaning a bit and probably won't be standing too much longer. I wanted to take the new camera out some more, so I headed out after work to try to take a few pictures last week. 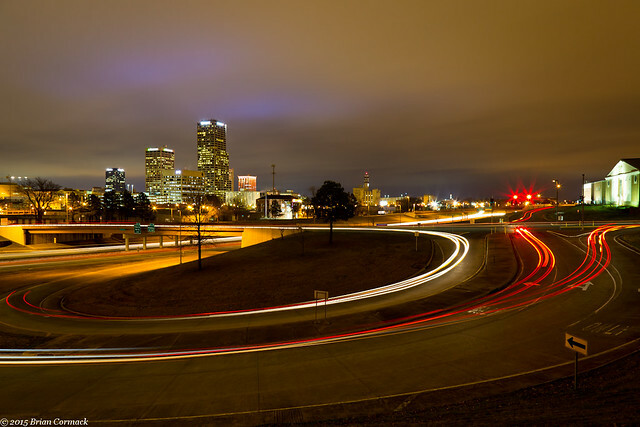 One night, I drove over to a spot that overlooks I-630 and part of the skyline. Rush-hour traffic zoomed by on the freeway and on the Chester Street bridge. 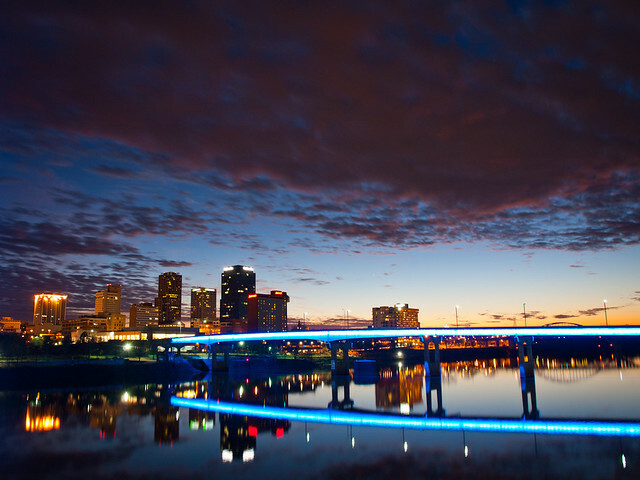 The next night I battled rush hour traffic again and went to the Two Rivers Bridge. It was very cold, below freezing, as I stood trying to get a few shots right after sunset. One of the things I'm most excited about the camera is the better ability to take pictures at night or in low light. 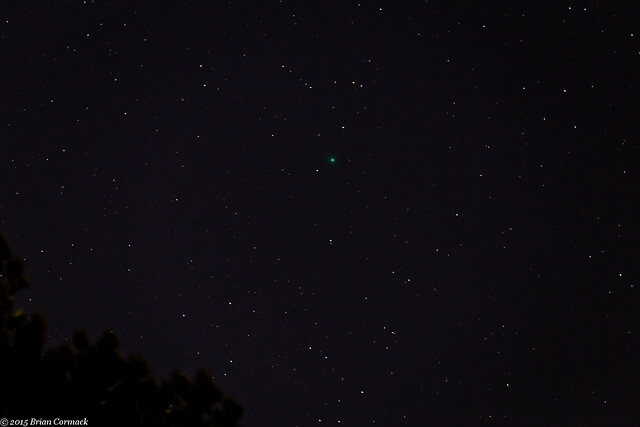 So to test it out last week, I headed over to John's house to borrow a 200 mm lens and try to find a comet. The comet Lovejoy is making an appearance this month, and is nearly bright enough to be seen by the naked eye (it helped to have a camera). We stood out in the freezing temperatures and found the comet, about 44 million miles away (it's the green dot). It was impressive to get a picture of, but I admit I would have been more impressed if there was something like a Death Star up there. Or in the very least, a Millennium Falcon. 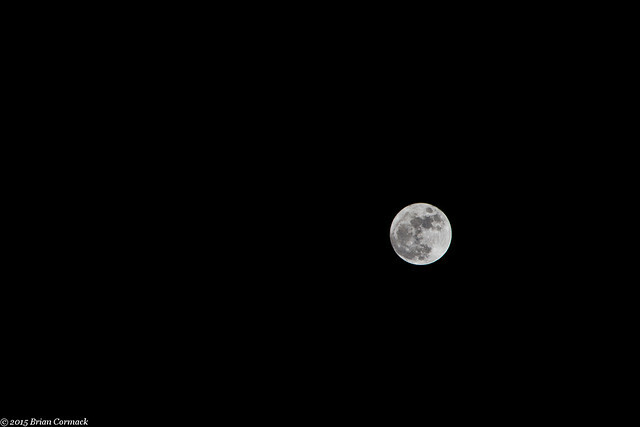 Mext, we swung the camera around and got a few pictures of the Moon (which was much easier to find than the comet). Last weekend, I wanted to take the new camera out for a few pictures. The weather promised to be rainy and foggy, and I tried to think of a good place to go. 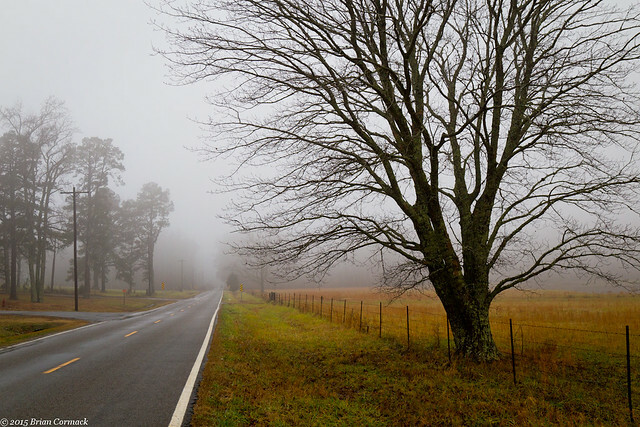 My original plan was to drive to a swamp in east Arkansas that I've been wanting to get pictures of in the fog. So I woke up at 8, grabbed the camera gear, and headed out of town on the freeway. It had rained overnight, but I didn't realize how much it had rained. There was a lot of standing water along the road, and the ditches were full. Maybe it was enough to get waterfalls going? So I turned around and started heading west, and then changed my mind and turned around again. No, I thought. Who knows if things will be running. Better stick to the original plan. A few minutes later I changed my mind again, and turned the car around. 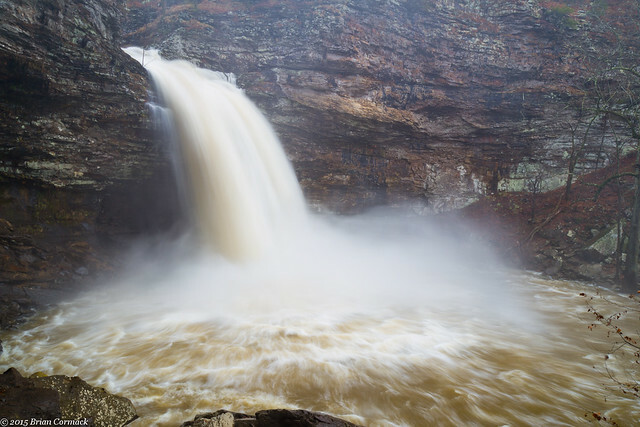 I decided to head to Petit Jean State Park, which should have waterfalls (or at least fog). All in all, I probably spent about 30 minutes driving in circles around Little Rock before heading to Petit Jean. 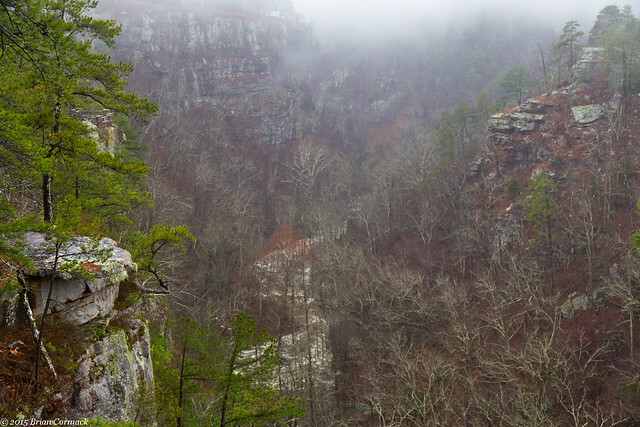 I finally got to Petit Jean, and the top of the mountain was covered in fog. I stopped several times along the road for a few pictures. 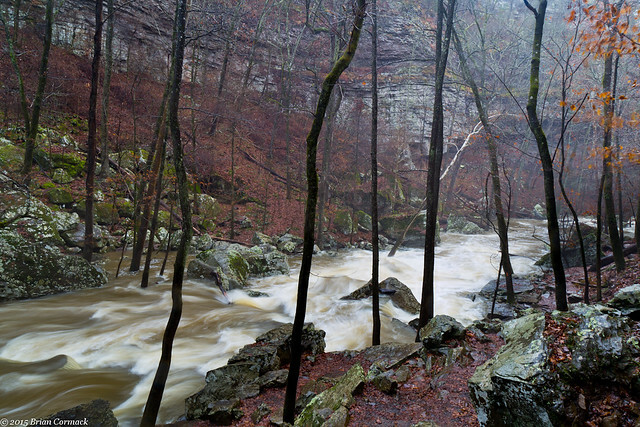 I had actually been up to Petit Jean the weekend before, but there wasn't much water in the creek. That wasn't the case on this visit. It had poured down rain the night before (dropping up to four inches in places). 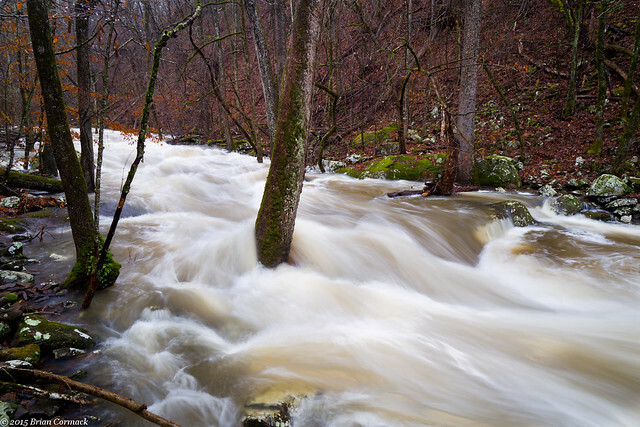 The creek was overflowing. 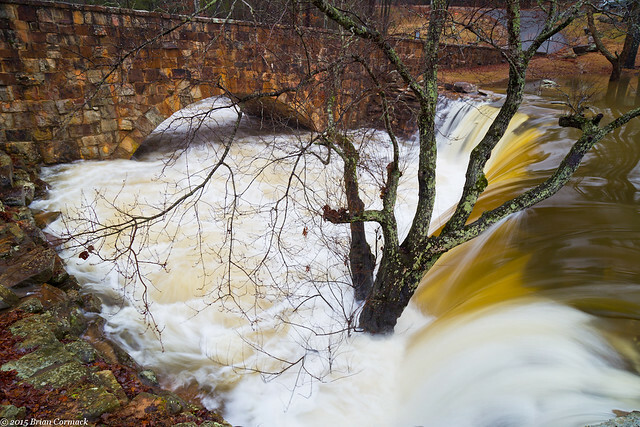 The small waterfall by the Davies Bridge, which was just a small tumble the week before, was raging. 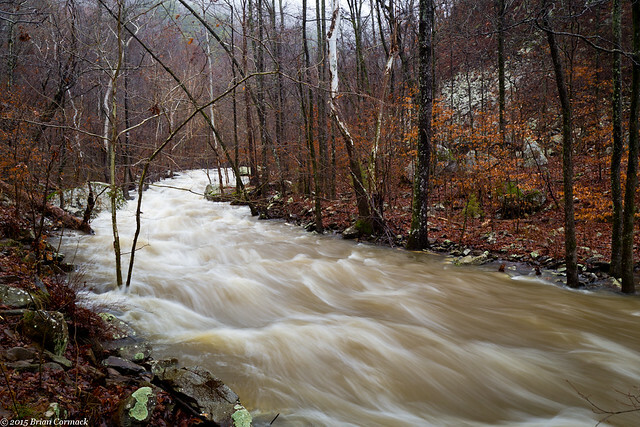 It was a torrent of muddy water, stretching nearly all the way across the creek. I walked along Cedar Creek below the bridge, or at least tried to. 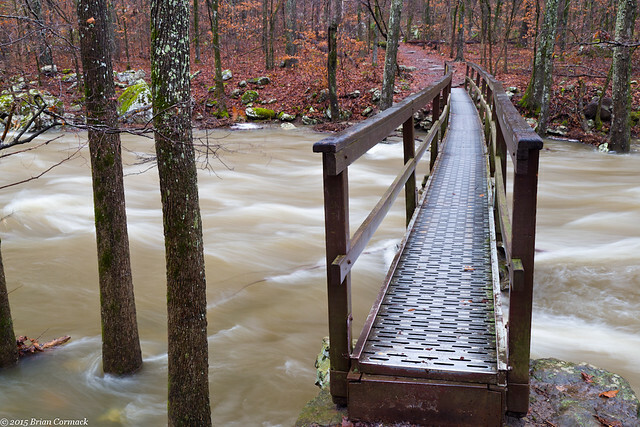 The Boy Scout trail that runs along the creek was under water. 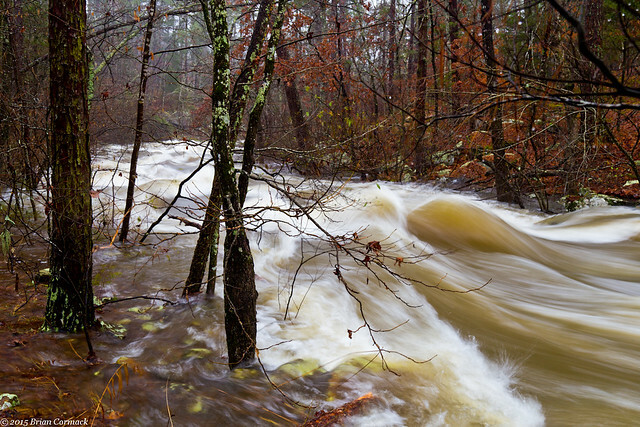 The usually peaceful creek was a raging deluge, with tall whitecaps rising out of the water. I had never seen Cedar Creek with this much water in it before. I drove over to one of the Cedar Falls overlooks to see what the waterfall looked like from above. As expected, the falls were churning. I peered down to the creek and didn't see anyone by the falls, which is a rarity. The creek was flooded and I wondered if the trail was closed due to high water. I decided to try hiking the trail to Cedar Falls anyways, and try to make it as far as I could. Even if you couldn't make it all the way to Cedar Falls, there were a few other things to see along the trail. One of those is the small stream that tumbles down the hillside by the trail. Usually there isn't much water here, but it was running full tilt that morning. Along the way I saw another hiker, who was making his way back from the falls. I asked how the trail was, and if it was passable. Oh yeah, he said, you can easily make it. The trail is flooded and you have to scramble on the hillside some. But it's doable. Plus, he added, there were a few other people there. Including a four year old girl. So that pretty much meant I had to make it to the falls. I was imagining the hike to be a lot worse than it was. I reached the bridge over Cedar Creek, which I nervously crossed. I really hoped the bridge wouldn't collapse while I was heading across. There were two spots where the creek was so high that the trail was flooded. To get past it, you had to go up along the hillside, which was a slick scramble over moss covered rocks. And finally I reached the falls. The sheer amount of water pouring down the falls was breathtaking. The spray from the falls was flying downstream like rain, and I was immediately soaked while trying to get a few pictures. I took several shots from this spot, and this is the one with the least amount of water on the lens. I tried to take a few more pictures, while trying to combat the constant spray from the falls and the water streaming in from the bluffs above. I started to head back on the trail, but stopped for one last shot of the creek. This is just below the falls, with the steep canyon walls in the background. I dried the water from the camera and stowed the new camera away (luckily I didn't drop it in the creek). I have been to this waterfall many times before, but I've never seen it flowing with this much force. It was definitely a memorable first hike for the camera to go on. Most people know Grady because it used to be a notorious speed trap along Hwy. 65, but there are some neat old buildings there too. This building is over a century old, and used to be a train station. It now sits empty, with the paint peeling off like pages. This was taken during the summer, and it was so humid that the camera lens would fog up every time I got out of the car. September 6: Clinton Library, Little Rock, Arkansas. 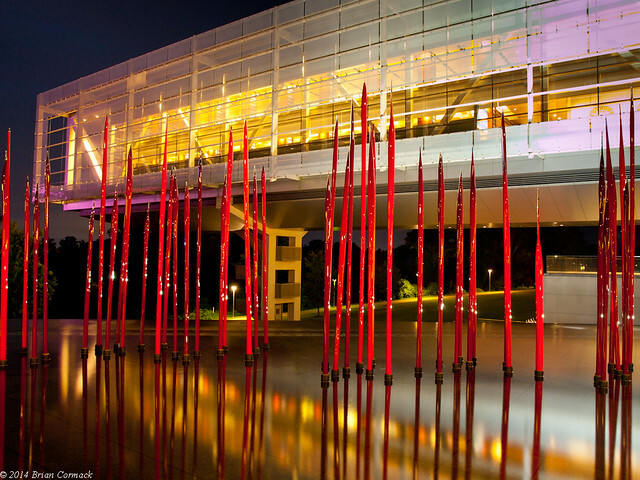 The glass tubes in the fountains were part of an exhibit by Mexican artist Dale Chihuly. The tubes have been here for a few months, and it’s amazing that they haven’t been broken or vandalized. I could easily see myself accidently bumping into one somehow, causing one to fall onto the others like a series of extravagantly expensive dominoes. February 8: The Old Mill, North Little Rock, Arkansas. I wouldn’t be a true native of North Little Rock if I didn’t include at least one picture of the Old Mill. 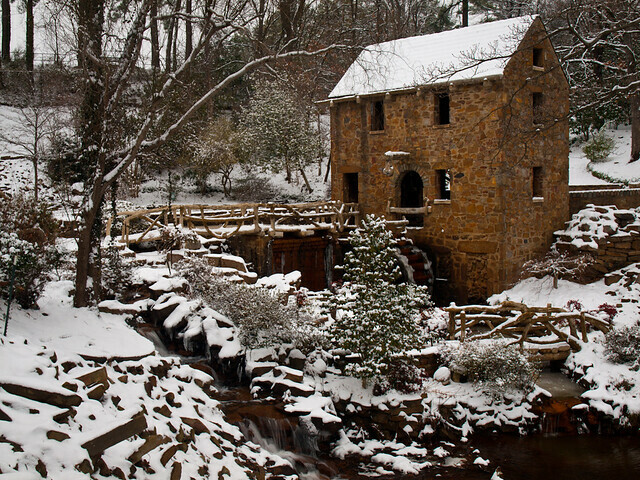 I have taken tons of pictures of the mill, but haven't ever taken any after a snow. So during one of our many snows last winter, I managed to get to the mill before the snow melted and the gate to the mill was actually open. 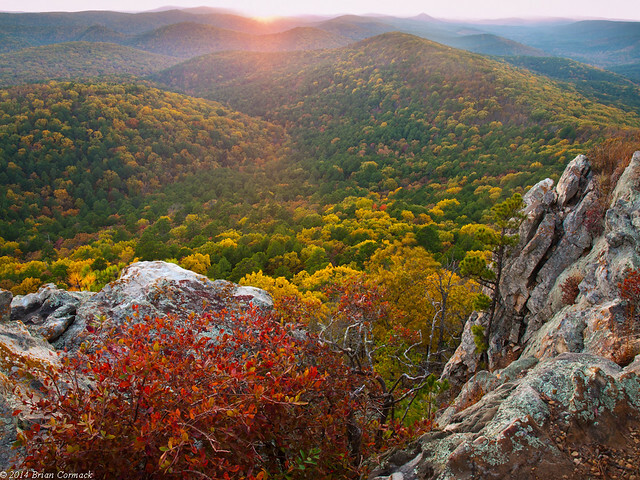 November 8: Flatside Pinnacle, Ouachita National Forest, Arkansas. The view from Flatside has to be one of the best in the state. The view of the wilderness here stretches on for miles. Flatside is located just about an hour’s drive from Little Rock, but it is still relatively unknown. There were just a few other people on the top of the mountain on the Saturday afternoon this was taken. Which was nothing compared to the hordes of people we encountered at Cades Cove in the Smoky Mountains a few weeks before. 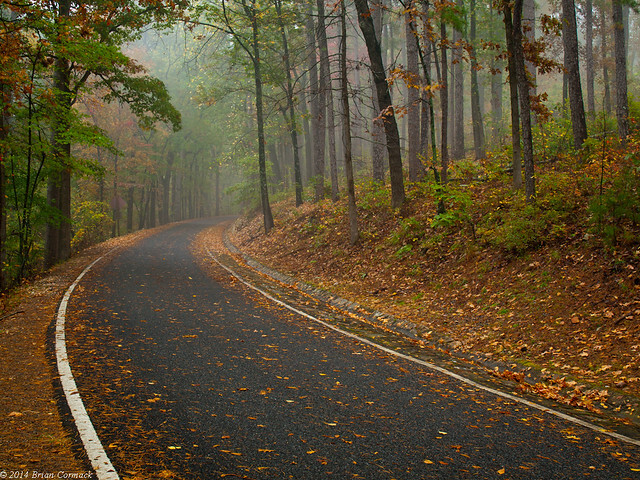 October 28: Hot Springs National Park, Arkansas. It was an interesting juxtaposition to go from the sprawling Great Smoky Mountains National Park (816 square miles) to the tiny Hot Springs National Park (8.672 square miles). Hot Springs is probably one of the most commercialized National Parks, but there is still some nice quiet places in the woods. This was taken along one of the roads that snake up the hills surrounding the city. It was raining, and fog was drifting along the top of the hills. 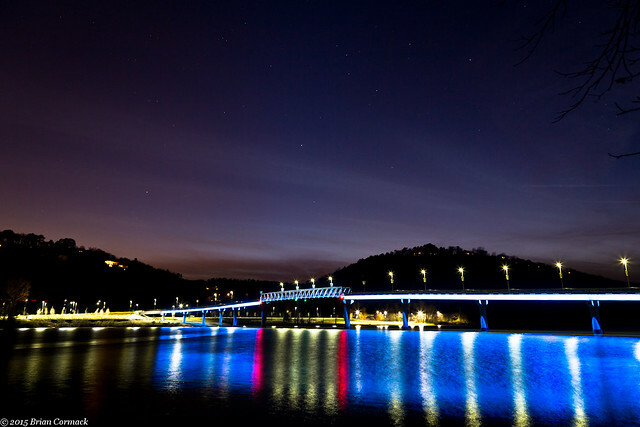 March 27: Big Dam Bridge, North Little Rock, Arkansas. This was taken after a rainstorm, and the Big Dam Bridge was reflected in a little dam puddle. 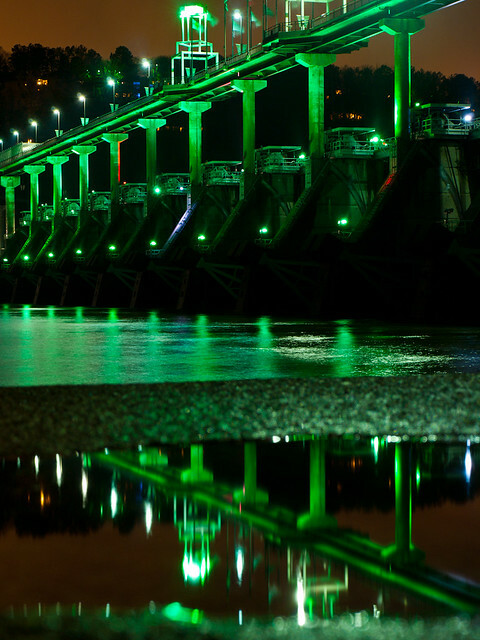 The lights on the bridge were green for St. Patrick’s Day. 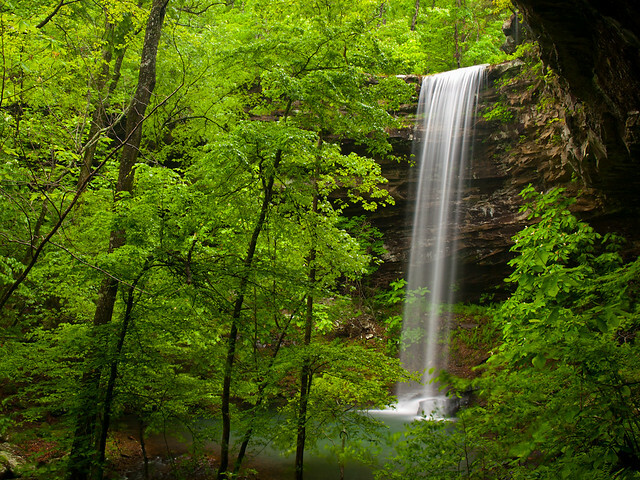 April 25: Falling Water Falls, Ozark National Forest, Arkansas. Falling Water Falls is a popular waterfall, mostly because it’s extremely easy to get to. You can actually drive right up to the side of the falls, which is a nice change of pace from having to hike a few miles to reach waterfalls. This was taken right before it got dark, and there was only a few minutes of daylight left. 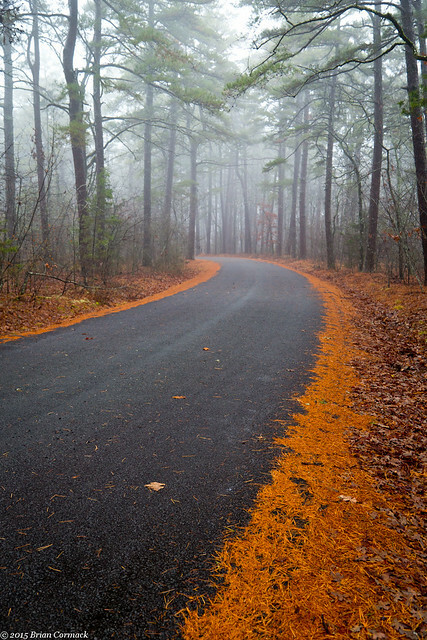 February 9: Winona Scenic Drive, Ouachita National Forest, Arkansas. 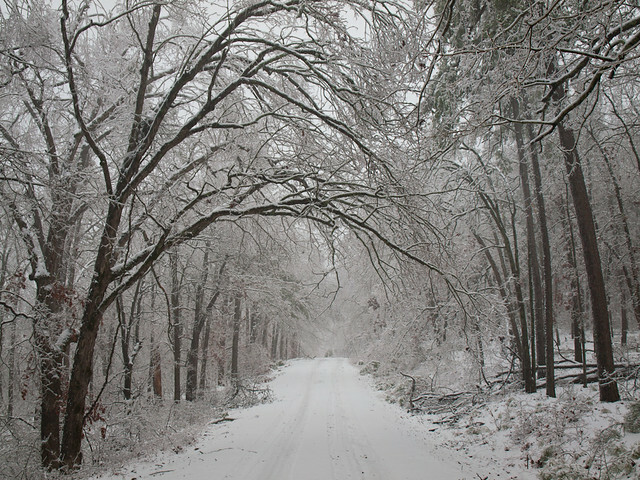 It was a snowy year, with several snowstorms hitting Little Rock (which meant several days when work was closed!). On one early morning, I headed out to the Flatside Wilderness with Matt and Zack to get a few pictures before the snow melted. But a bunch of trees were down across the road, and we didn’t get very far. 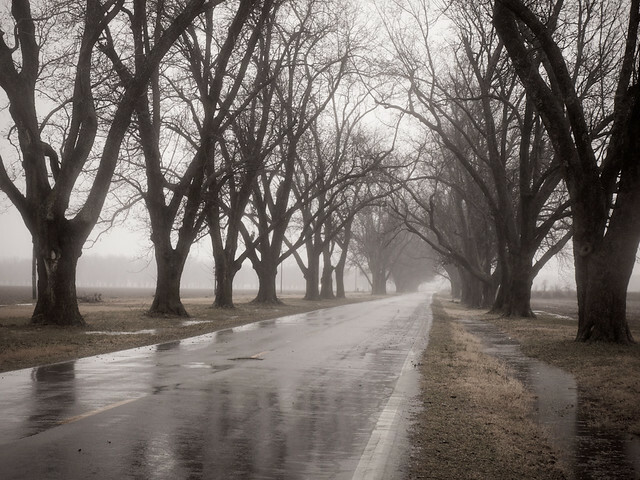 This was taken on a rainy and foggy evening, just before dark. I was huddled under an umbrella, trying to keep the camera dry, and probably looked like a crazy person to anyone who drove by. 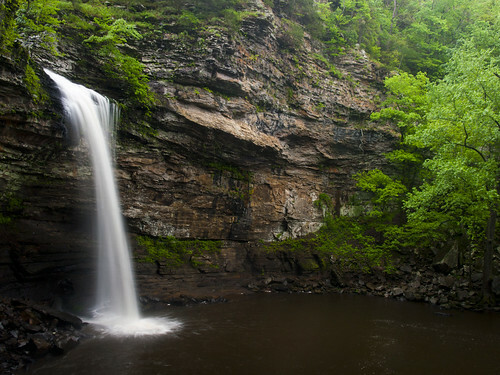 May 3: Fall Creek Falls State Park, Tennessee. While Caroline went to a baby shower in Nashville, I had a few hours free to kill on my own. So of course it meant a trip to find a few waterfalls. So I sleepily woke up before dawn and drove over to one waterfall, located in a state park. I spent a lot of time researching this waterfall before the trip, but failed to notice one important detail: When the park opened. I drove to the park, only to see it gated shut. So after a few minutes cursing out the person in the Tennessee State Parks who set the opening hours, I hurried over to another park. 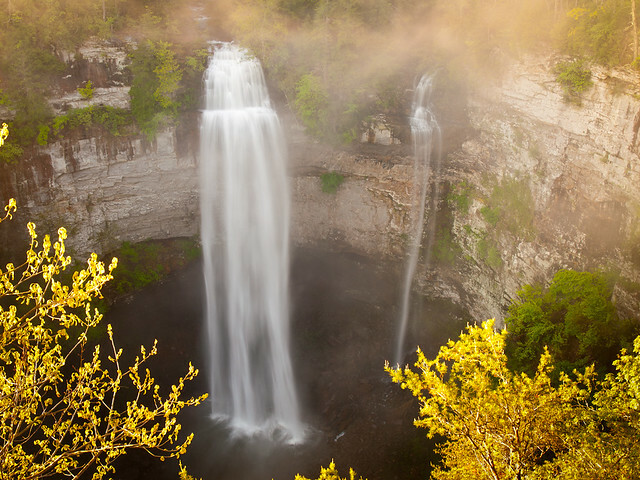 This is Fall Creek Falls, with light from the rising sun hitting the mist from the falls. 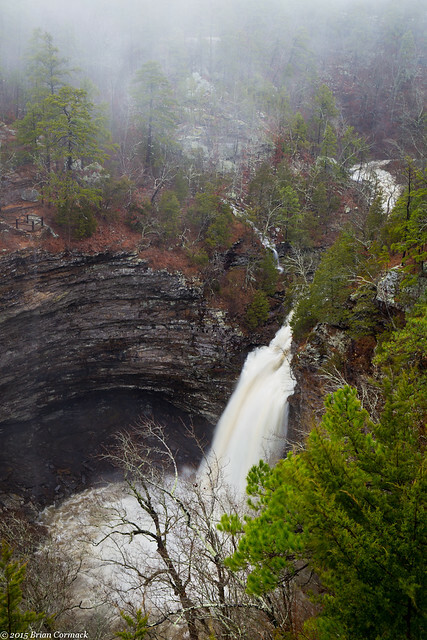 At 256 feet, this is the highest free-flowing waterfall east of the Rockies. December 28: Carden Bottoms, Arkansas. I was lucky enough to get a new camera for Christmas, and I’m still trying to figure everything out on it. This was taken on the camera’s maiden voyage out into the woods. 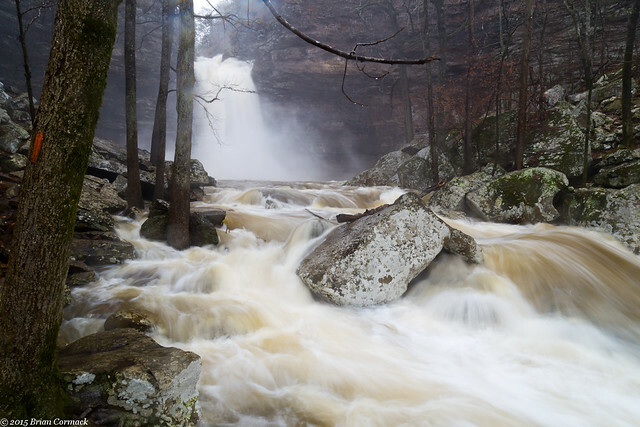 I tried to hit some waterfalls at Petit Jean Mountain, but there wasn’t much water. 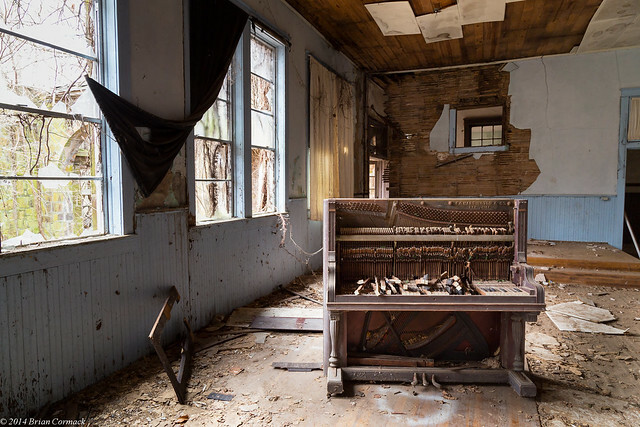 Instead I headed to an old abandoned school, empty for the past several decades. Fortunately, the new camera didn’t get dropped through any holes in the floor. Or catch any ghosts lurking in the background. 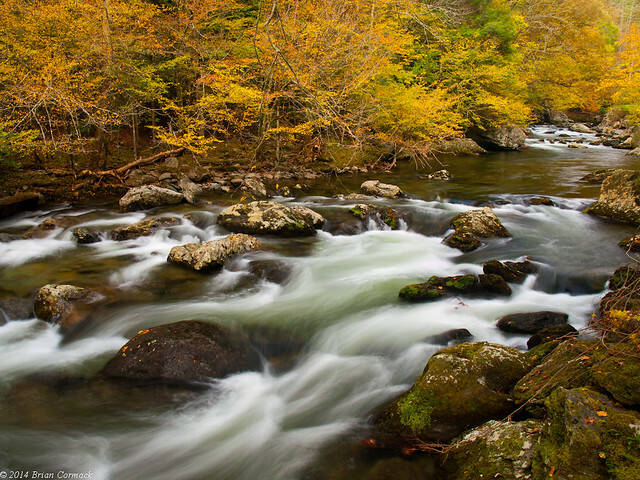 October 21: Oconaluftee River, Great Smoky Mountains National Park, North Carolina. For our first anniversary, Caroline and I headed out to a cabin in the Smoky Mountains. On our first day, we drove to Cades Cove, which is a beautiful area with old homes, barns and miles of forests. It’s also the most popular spot in the park, and it was crammed with people and cars. But luckily the rest of the park is a little less crowded. 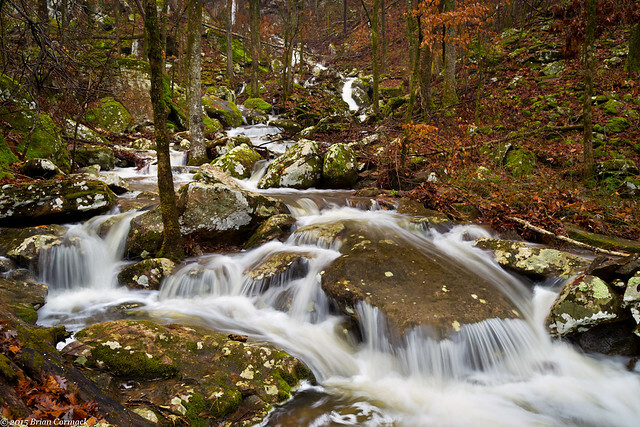 This was taken along a mountain stream that runs below a few trees that were showcasing some nice fall color. April 26: Copperhead Falls, Buffalo National River, Arkansas. 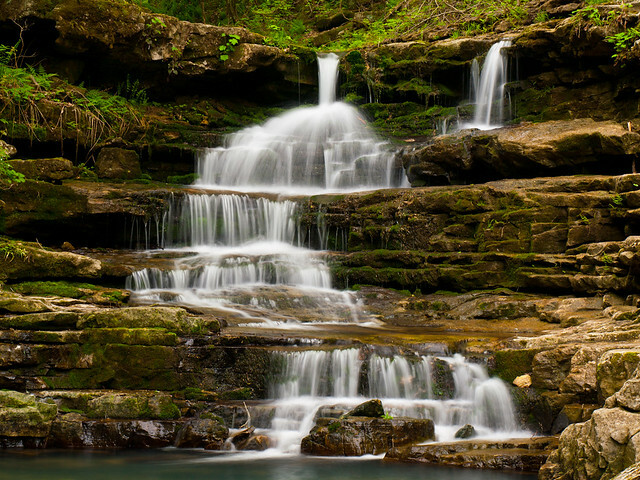 This delicate waterfall is located in Indian Creek canyon, which is one of the most beautiful and rugged places along the Buffalo River. The hike is a rough and difficult few miles, but there are some great spots that are worth the sore legs. February 20: Latourell Falls, Columbia River Gorge, Oregon. If we were to ever move away from Arkansas, I think we’d end up in Portland. It has everything you’d ever need. It has a MLS team, great food, countless breweries, and is surrounded by waterfalls. 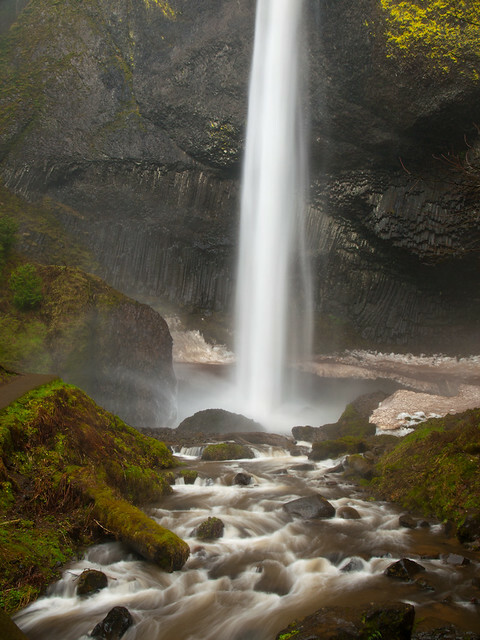 This waterfall is nearly 250 feet tall, and is less than an hour’s drive from Portland. The trail here was being bombarded by mist from the falls, which made me thankful that my camera bag is waterproof. December 6: Arkansas State Capitol, Little Rock. 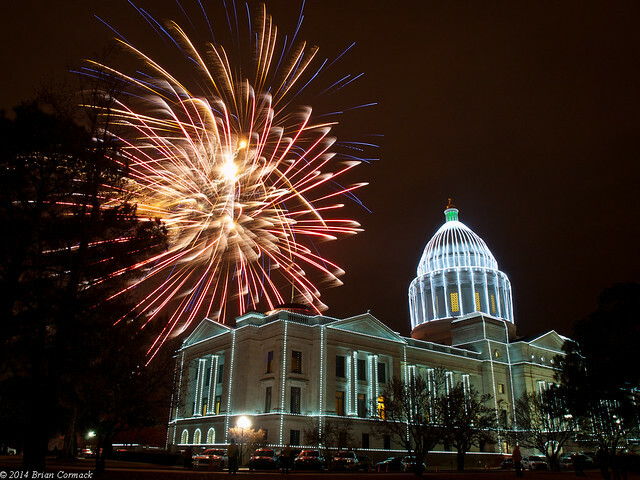 After the 90,000 lights on the state capitol are switched on, there is a little fireworks show. This is after a ceremony where a few state politicians got up to speak. Since most of the crowd was little kids, they didn’t care and only wanted to see Santa. May 17: Bowers Hollow Falls, Buffalo National River, Arkansas. 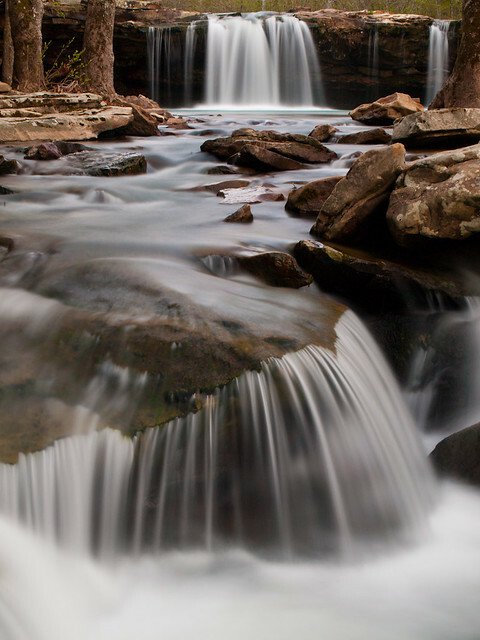 Bowers Hollow is one of the prettiest waterfalls in the state. It had just stopped raining when Zack and I headed out at dawn to start the four mile hike to the falls. 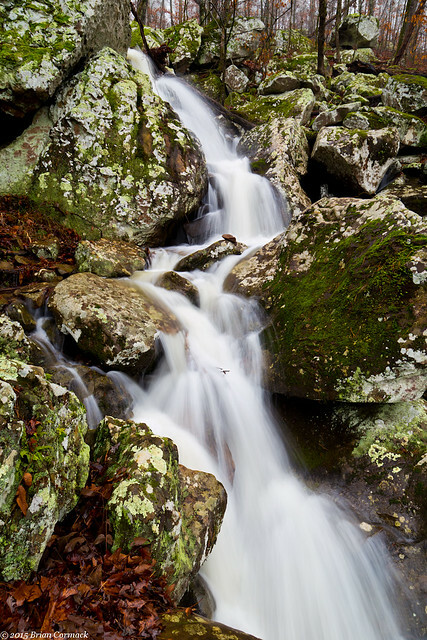 The hike has a few tricky places, so it’s been rated as a “difficult bushwhack.” It’s well worth the effort, since it’s an easy place to fill up all of your camera’s memory cards. 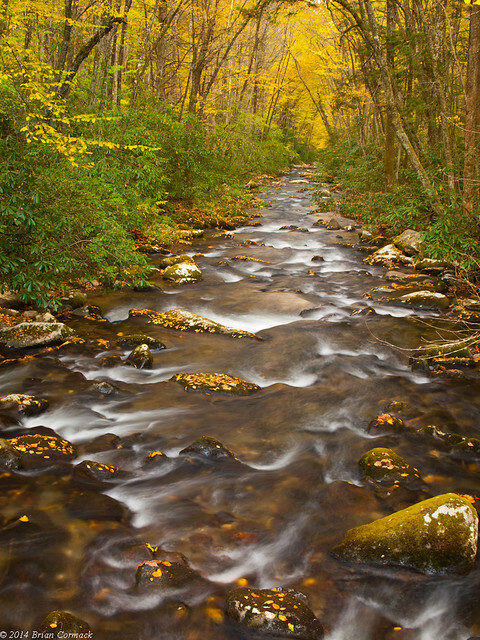 October 20: Little River, Great Smoky Mountains National Park, Tennessee. This may be a little river, but it’s big on scenery. 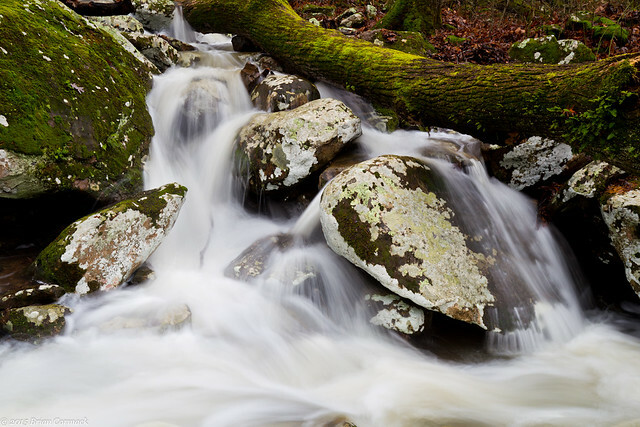 The river starts out along the slopes of the 6,643 foot tall Clingmans Dome, and then drops down into the Little River Gorge. Here the river churns and jumps past huge boulders. I stopped several times, and was very thankful that I have a very patient wife. This wasn’t the best year for fall color in the Ozarks, but I wanted to get a few pictures of it while I could. 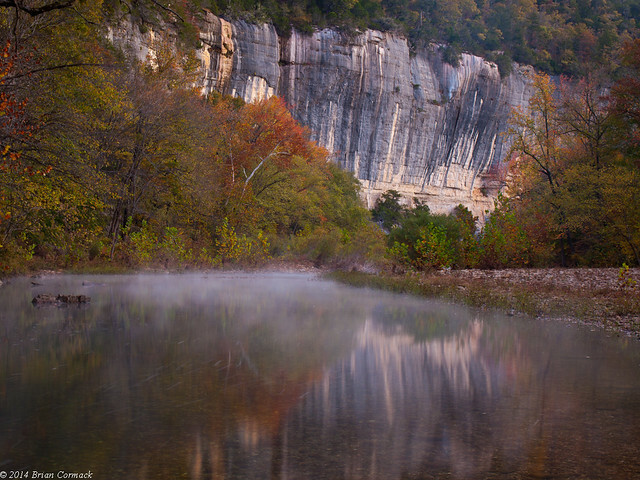 So I headed up to Steele Creek, my favorite spot along the Buffalo River. It's one of the most consistently scenic spots on the river, and also where I proposed to my wife last year. I made this trip on the first really cold morning of the fall, and frost flowers were growing in the fields along the river. 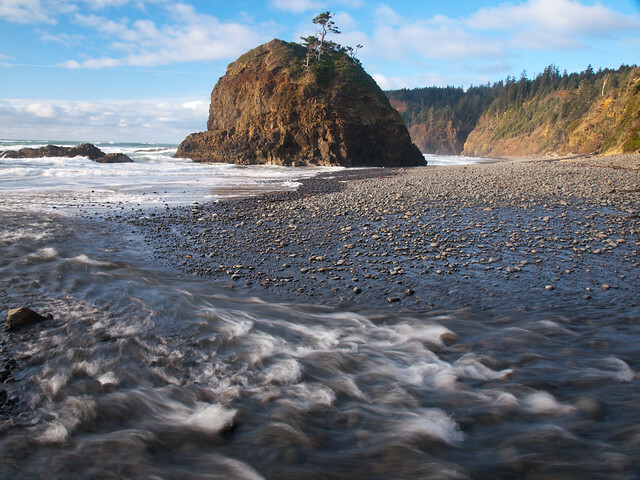 February 21: Near Cape Meares State Park, Oregon. This small creek runs over a waterfall and then flows into the Pacific Ocean. Cape Meares is in the background, with bluffs that are about 200 feet tall. After these shots, we headed into Tillamook for a wine and cheese tasting (which isn't a bad way to end a day taking pictures). 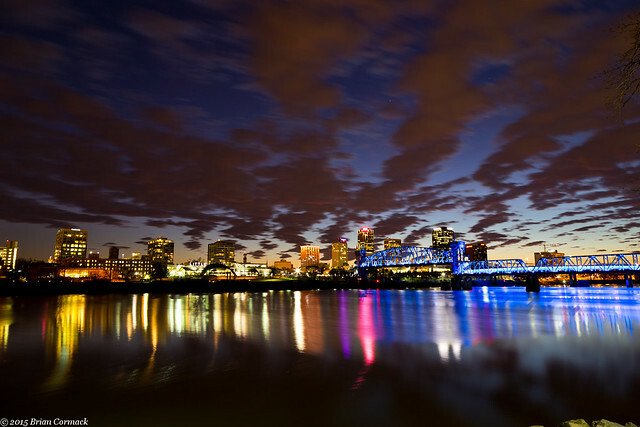 January 26: Little Rock, Arkansas. I somehow was lucky enough to be taking pictures with both a good sunset and a perfectly still river below it. There has to be no wind, no boats, no fish or sea monsters stirring in the river for it to be this smooth. 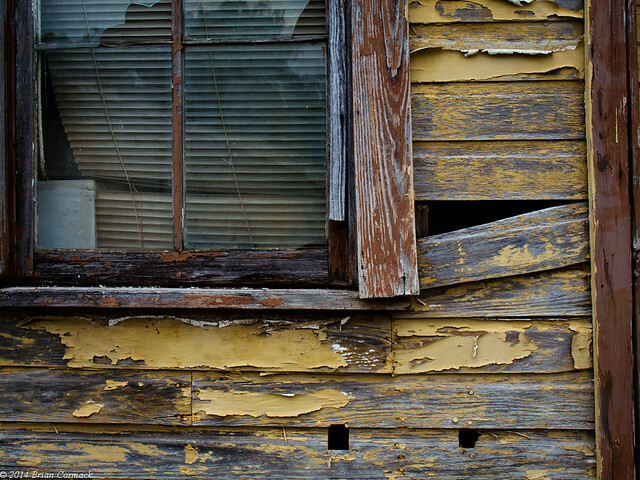 In the fall, I submitted this to the Arkansas State Fair photography contest and actually won first place. 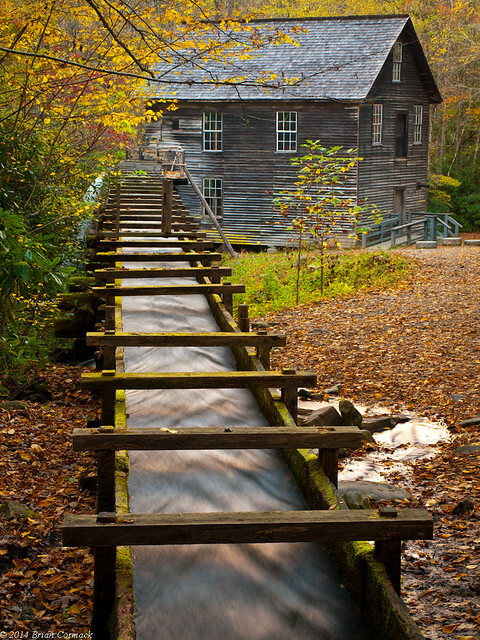 October 21: Mingus Mill, Great Smoky Mountains National Park, North Carolina. This was the one spot in the Smokies that I was most eager to visit. The mill was built in 1866 and is still operational. Water from the creek is diverted through a wooden chute to the mill, with excess water pouring off in a waterfall. This was taken right before dusk, after the small crowd there had finally cleared out. April 26: Indian Creek, Buffalo National River, Arkansas. The trail through Indian Creek has been rated as a difficult hike, and apparently the National Park Service says more people injure themselves here than any other area of the park. This waterfall sits at the very end of the hike, unless you want to make things more difficult for yourself. If you'd like, you can continue on from here to see the Eye of the Needle (by climbing up a rope, scrambling up a steep hillside, and then crawling through a small cave). It's apparently easier for a camel to go through the eye of a needle than it was for me to reach this Eye of the Needle, but I made it. Only to find that the creek was flowing underground, and the waterfall at the Eye of the Needle was completely dry. Oh well, we can try again next time! 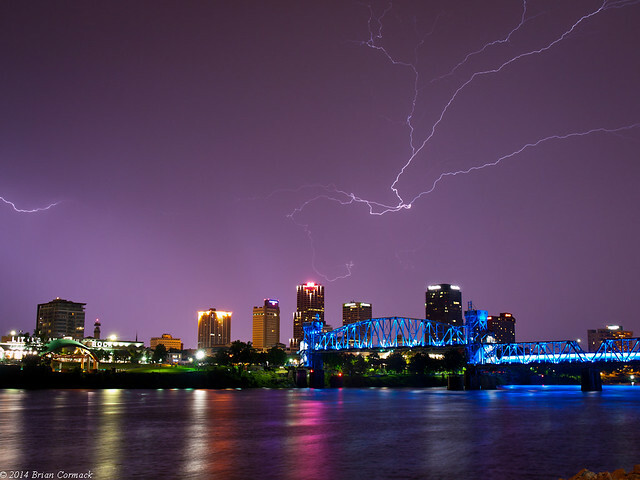 July 8: Little Rock, Arkansas. Taking pictures of lightning isn't very easy. You have to be set up in the right place, at the exact right time. And then hope the camera is actually taking a picture in the few seconds that the lightning is flashing (and hope that the camera is pointing in that direction). I was out there for about two and a half hours, and took 241 pictures. This is the only shot that managed to get any lightning. 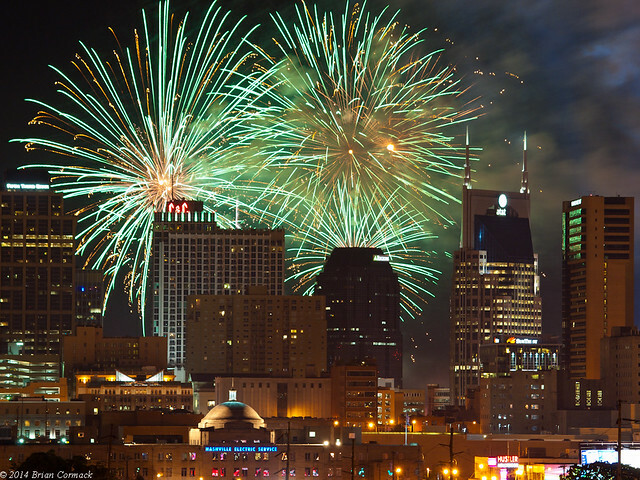 We were in Nashville around Independence Day for a wedding, and went to take pictures of the fireworks show there. I did some research and found a parking garage that had this great view of the skyline. It was also good since we were far enough away from downtown that we didn't get stuck in the traffic from the thousands of people who crowded the riverfront to see the fireworks up close. May 30: San José del Cabo, Mexico. Growing up in a land-locked state, I’ve not been able to take many pictures of the ocean (this was a sea actually, the Sea of Cortez). So it was an interesting experience to try to get pictures of this beach, located along the very bottom tip of the Baja Peninsula. It was a neat location, the only downside being that we weren’t by the unlimited food and drinks that were offered by the all-inclusive hotel we were staying at. 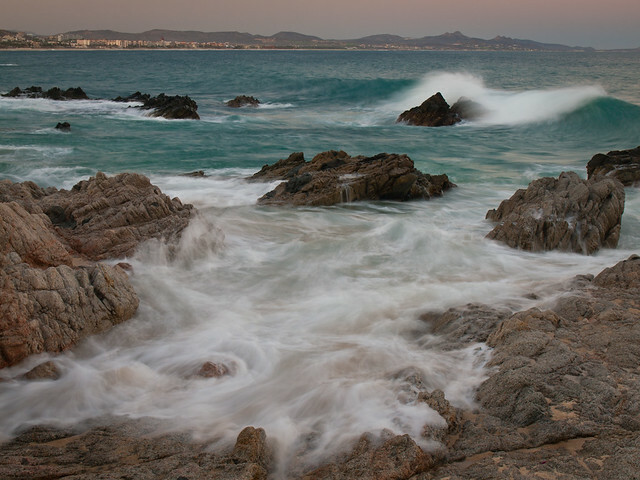 Unfortunately, a few months later a large hurricane slammed into this part of Mexico. The hotels and resorts were devastated and are just now starting to open back up again. This was a great city to visit, and we'd like to visit again soon sometime. So here we are at the end, thank for sticking along with me to the end of this post! Looking forward to a happy and waterfall-filled 2015.